Triple J Furniture is nestled in Sydney but has been active in Brisbane and Melbourne. They have been serving the people of these areas with top quality products at a reasonable cost. The firm has a huge collection of wooden products that are manufactured from the top quality wood. Buyers will get a classic design, modern design along with customised design to suit the ambience. The best part about this company is they have something for everyone whether old or new customers. 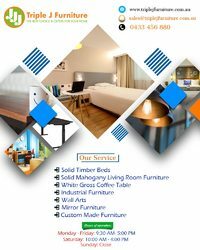 People can buy solid timber beds, white gross coffee table and industrial furniture from this store along with other at attractive cost. Get in touch for assistance. Method of Payments: Visa Master, Cash, Cheque, Discover, PayPal, Bank Transfer. Hours of operation: Monday - Friday: 9:30 AM- 5:00 PM. Saturday: 10:00 AM - 4:00 PM. Sunday: Close.